Eugene C. Tarne | October 1, 2013. The Maryland Stem Cell Research Commission (Commission) is charged with overseeing the distribution of state funds for stem cell research. Through the Maryland State Stem Cell Research Fund (MSCRF), the commission has distributed millions of dollars in grants since it was legislatively established in 2006. The Commission’s work to identify and provide public funding for the most promising avenues of stem cell research is reminiscent of the work done by the California Institute for Regenerative Medicine (CIRM). Previously on this website, the Lozier Institute examined how CIRM has been distributing funds since its first round of grants in 2007, up to the present (here, here and here). These reviews of CIRM’s funding patterns over the years revealed a steady turn away from its initial preference for human embryonic stem cell research (hESCR) and progression towards a steadily-growing preference for funding non-hESCR alternatives, including adult stem cell and induced pluripotent stem cell (iPSC) research. This shift in funding preferences paralleled an increasing emphasis on CIRM’s part for giving funding priority to projects most likely to lead to clinical applications. Given this shift in funding, it is fair to conclude that in CIRM’s judgment, those projects most likely to result in clinical applications are not those using hESCs. Rather, they are those projects that utilize non-embryonic alternatives. An analysis of the Maryland Commission’s most recent round of grants – and of previous grants over the years — reveals a similar pattern. The first round of grants issued by the Commission was in 2007[ii]. The clear winner in terms of number of grants and funds allocated were projects focusing on human embryonic stem cells (hESCs), with 45% (11) of the 24 awarded grants going to these studies. Three grants (12%) went to studies using both adult and hESCs, while only 16% (4) grants went to projects focusing on adult stem cells. [iii] The grants for hESC projects amounted to $5.21 million, more than twice the $2.4 million awarded to adult stem cell research. 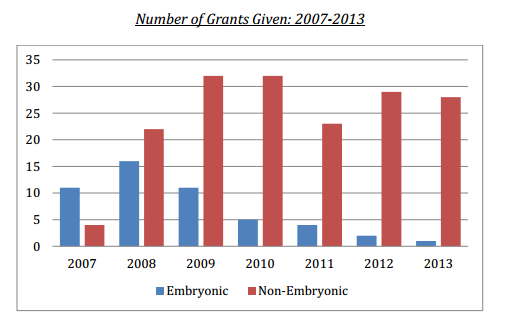 The 58 total grants the Commission awarded in 2008 were split almost evenly between adult and human embryonic stem cell research projects: 32% (18) went to adult and 27% (16) to embryonic, totaling just under $5.3 million and just under $4.1 million, respectively (5 projects using both embryonic and non-embryonic stem cells also received funding). This was also the first full year that stem cell researchers were able to take advantage of a new development: induced pluripotent stem cells (iPSCs). In November, 2007, Shinya Yamanaka discovered a way to reprogram the genes of ordinary cells to turn them into an embryonic-like, fully pluripotent state; he dubbed these cells induced pluripotent stem cells (iPSCs). Yamanaka’s iPSC achievement would prove to be a game changer in the field of regenerative medicine; in 2012, the Nobel Committee recognized his achievement by awarding him the Nobel Prize for Medicine. The importance of this achievement is also reflected in the commission’s grants for 2009, which totaled 58 in number. That year, the number of grants for iPSC research quadrupled over the previous year, from 4 to 16 (28%), for a total of $7.5 million. Adult stem cell research also received 16 (28%) grants, totaling $2.8 million for a total of $10.3 million for non-hESCR. Grants for hESCR projects were fewest in number at 11 (19%), but those grants totaled just under $4.1 million. However, taking together both adult and iPSC grants, the total amount awarded to non-embryonic stem cell research amounted to $10.1 million, more than double the amount awarded to hESCR. 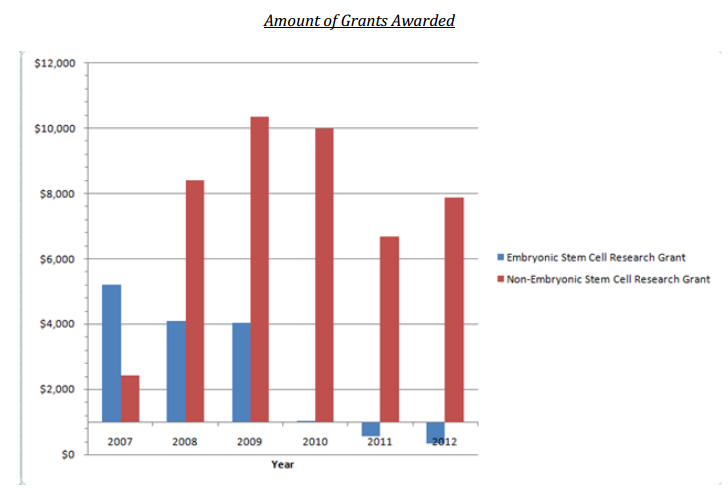 The 2010 grants show a decisive turn toward non-embryonic stem cell research and away from hESCR, with adult and iPSC research receiving almost 80% of the total number of grants awarded. Of the 41 grants awarded, 27% (11) went to adult stem cell research for a total of $2.8 million. For the iPSC research, 51% (21) of the grants were awarded totalling $7.1 million. Only 12% (5) of the grants were for hESCR and totaled just over $1 million. The total amount of funding for non-embryonic stem cell research in 2010 was $9.9 million, outnumbering the funds dedicated to hECR by almost 10 to 1. While the total number of grants awarded by the commission in 2011 dropped to 34, the trend towards favoring non-embryonic stem cell research continued. Eleven grants (32%) went to adult stem cell research, for a total of $3.03 million, while research with iPSCs received 35% (12) of grants, amounting to $3.66 million, bringing the total awarded to non-embryonic stem cell research to just under $6.7 million in funding for 23 projects. In stark contrast, hESC projects only received 12% (4) of grants, which amounted to less than a half-million dollars, $560,000. The Commission awarded 40 grants in 2012 and, in a now familiar pattern, the clear majority of them went to non-embryonic stem cell research. Twelve projects (30%) using adult stem cells were funded, for a total of just under $3.2 million. In addition, 43% (17) of the awarded grants dealt with iPSC’s (including one using both adult cells and iPSCs) and totaled just under $4.7 million, bringing the total amount of funding for non-hESCR to $7.89 million. .
Two hESC projects (5%) received funding in the total amount of $340,000. The MSCRF has not yet posted the specific amounts awarded to these projects. However, based on category (see footnote 2), approximately $8 million is potentially available for the 28 non-embryonic stem cell research projects, while the hESCR project could receive up to $110,000. In 2001, Johns Hopkins-affiliated researcher Bert Vogelstein appeared before a Senate panel to argue for increased federal funding for hESCR. Toward this end, Vogelstein highlighted the therapeutic potential of hESCs for treating Parkinson’s, spinal cord injury, and diabetes. He contrasted this supposed vast therapeutic potential of hESCs with the very limited usefulness of adult stem cells. Ten years have come and gone and none of the vast therapeutic promises made in the name of hESCR have come about. The MSCRF has not awarded any grants to researchers from Johns Hopkins or any other institution for SCNT research, and it is unlikely to do so. When researchers in Oregon announced in June, 2013 that they had finally succeeded in cloning a human embryo and harvesting stem cells from it, the news received a decidedly lukewarm reception. Vogelstein was certainly not alone in hyping the therapeutic potential of hESCR while offering only faint praise for adult stem cell research. But as the funding patterns over the years of the MSCRF show, the opposite of what so many researchers so confidently predicted has happened. Adult and other areas of non-embryonic stem cell research, such as iPSC research, have seen vastly increased funding, while funding for hESCR has sharply decreased. And the use of SCNT to clone embryos for patient-specific stem cells now seems quaint. Proponents of hESCR may still talk up the supposed ongoing necessity of such research. But as the saying goes, money also talks. Looking at the projects that both CIRM and MSCRF have been funding more and more over the years, what the money is saying is that those viable alternatives exist and it is with them that the real therapeutic promise of regenerative medicine lies. *Gene Tarne is a senior analyst at the Charlotte Lozier Institute. Andrew Mullins is the Bioethics and General Policy intern at the Family Research Center (@AndrewWMullins). [i] The other scientist credited with first isolating hESCs is James Thomson of the University of Wisconsin. Gearhart isolated the cells from embryonic germ cells, while Thomson isolated cells harvested from the inner cell mass of the embryo at the blastocyst stage. [ii] The commission organizes grants into four categories and the amount of a grant varies and is dependent on its category. The remaining study in the 2007 round of grants involved fetal tissue. From a scientific perspective, these cells would be classified as adult/non-embryonic and so reflect a move away from hESCR. However, because fetal tissue is most often derived from aborted fetuses, it presents the same ethical problems associated with the derivation of hESCs. [iv] Fully 15 of the grants in 2008 went to projects involving cscs, or for improvements in research technologies. [v] The remaining study was with both embryonic and non-embryonic stem cell lines; on this and on fetal tissue, see footnote 3, above. [vi] Spoken testimony before the Labor, Health and Human Services, Education and Related Agencies Subcommittee, Committee on Appropriations, U.S. Senate, 10/31/01.